Calum McSwiggan. 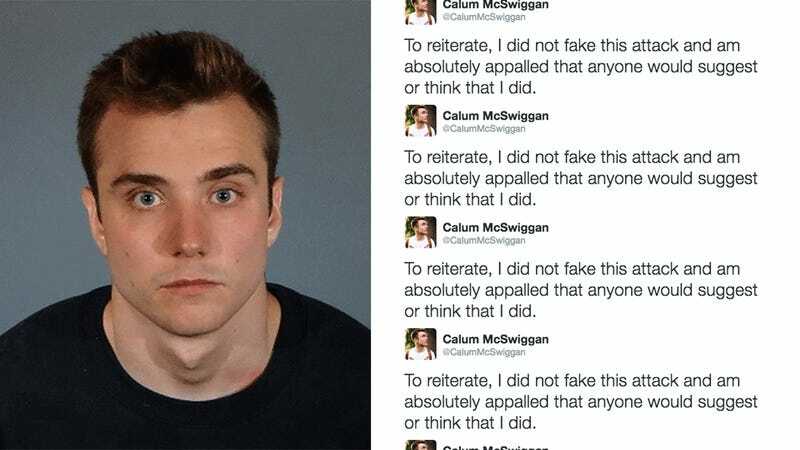 Say it with me, now: Calum McSwiggan. It’s a fun name—Calllummm McSwigggggannnn—but I’m hoping this post marks the last time I ever have to write about him because his recent scandal has gone from a semi-satisfying bit of schadenfreude to a bleak snapshot of a very particular slice of popular culture. [I was] beaten up by three guys. The authorities should have been there to help and protect me but instead they treated me like a second class citizen. With three broken teeth and six stitches in my forehead, I’ve never felt so terrified to be a gay man in the public eye. He went to The Abbey, was beaten up for being gay, blacked out, woke up, vandalized the attackers’ car as revenge, was arrested for vandalizing the car, hit himself with the prison pay phone in order to be given medical care for his other injuries, blacked out, was sent to the hospital, and was eventually released. McSwiggan is scheduled to appear in court on July 19. Images via screengrab, the Los Angeles Police Department.